Department of Homeland Security Secretary Kirstjen Nielsen told Fox News there is intelligence indicating the caravan of migrants making their way through Mexico includes a limited number of people from outside the region, including the Middle East. "We absolutely see people from the Middle East, from southeast Asia, from other parts of the world -- not just from Central America," Nielsen said in a wide-ranging interview. The caravan started in Honduras last month. This week, hundreds of migrants have begun arriving in Mexico City, seven hundred miles from the U.S. border. President Trump, who has vowed to stop the caravan from entering the United States, tweeted last month that “criminals and unknown Middle Easterners” are among the migrants. Democrats, as well as some Republicans, have accused the Trump administration of fear mongering. "Now, in 2018, they’re telling you the existential threat to America is a bunch of poor refugees a thousand miles away,” former President Barack Obama said at a campaign rally on Friday. “They’re even taking our brave troops away from their families for a political stunt at the border. And our men and women deserve better than that." Speaking of the non-Central American migrants, Nielsen told Fox News, "we don't always know exactly who they are." "What I can tell you is we stopped 3,000 people last year at the southwest border who had patterns of travel similar to a terrorist," Nielsen said. "We call them special interest aliens." The issue of special interest aliens, or SIAs, came to a head under the last administration. In June 2016, then-Homeland Security Secretary Jeh Johnson convened a multi-DHS component task force called the "SIA Joint Action Group" with the primary task of developing a plan to "counter threats posed by the smuggling of SIAs." There is not a great deal of publicly available information, but the SIA designation is said to cover a collection of 35 countries where known terrorist groups operate. 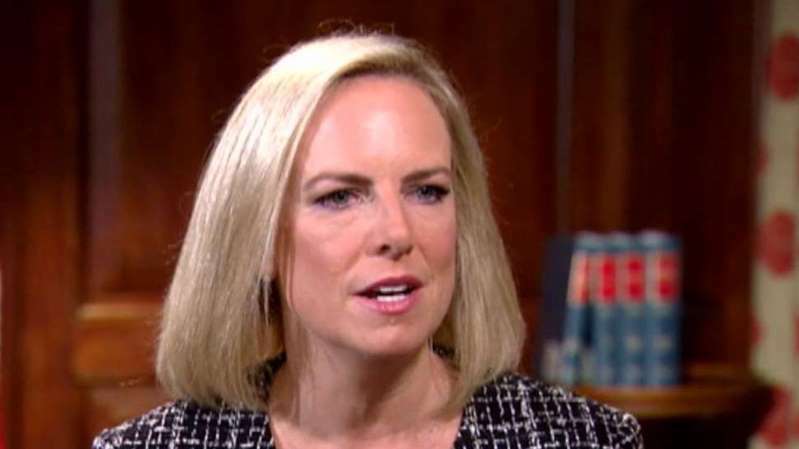 Meanwhile, Nielsen said the Department of Homeland Security is seeing real concern among the nations directly affected by the caravans. "We are hearing from our partners in the region -- in Guatemala, Honduras and El Salvador, in Mexico -- that they have some concern with respect to the timing and the particular organization of these caravans,” she said. “They're not organic if you will. They're definitely organized or financed." Nielsen said DHS “very seriously” is attempting to determine the origins of these caravans. “Mass migrations aren't good for anybody and not safe for the migrants,” she said. “They unfortunately allow criminal elements to prey on vulnerable populations...those who might otherwise have a legitimate claim." Nielsen also echoed warnings from Guatemala’s intelligence chief that the most vulnerable are pushed ahead in an apparent effort to frustrate border police and the military. "They don't want to get into a confrontation with a child, more women and so they're almost being used as barriers at the front of some of these caravans, but what I will say is the other caravans coming up are mostly single males," she said. Latin America specialist Joseph Humire, who was on the ground with Guatemalan intelligence 10 days ago, said some caravans operate in a military fashion. "What I saw was a high level of logistical organization," said Humire, the executive director of the Center for a Secure Free Society. Based on his work, Humire said the caravans he documented are not using routes associated with drug smuggling or human trafficking. They are taking longer routes with more infrastructure to reach their destinations, he said. "What I learned from Central American intelligence is that there were at least 132 individuals that came from other parts of the world not from Latin America," Humire said. In a follow-up phone call Monday, Humire said the number of non-Central American migrants may be as high as 232 in Guatamala alone, based on new information he received from that country's intelligence service. Referring to an incident earlier this year, Humire said sometimes individuals lie about their identities and try to deceive immigration authorities. However, officials are able to discover fraudulent claims through biometrics and the help of partner intelligence services who have access to databases. "We have seen individuals they have lied about their identities and tried to deceive immigration authorities saying they are from Pakistan and turned out to be from [the Palestinian territories] or saying they're from Bangladesh and turned out to be from Syria,” he said.